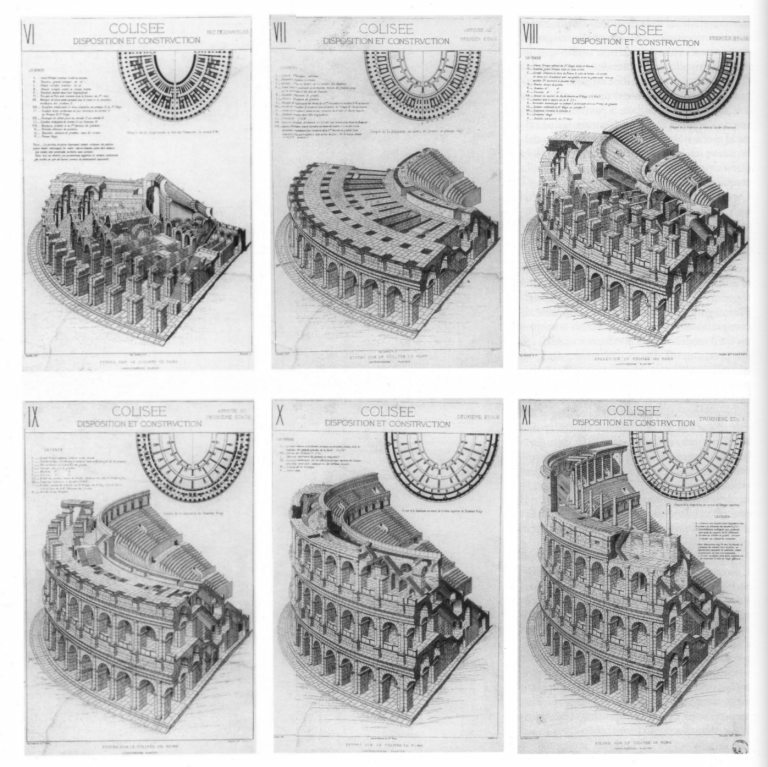 The following is my translation of the chapter on the building philosophy of the Colosseum (from Giuseppe Cozzo, Il Colosseo - Fratelli Palombi Editori - Roma, 1971). 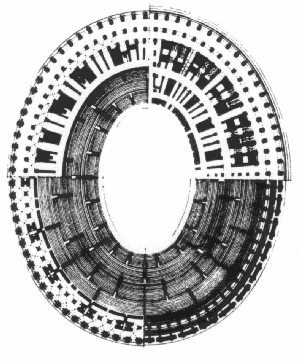 An approximate estimate of the workers necessary to build the amphitheatre, in the brief span of time confirmed by historical documents, concluded that their number was so great that it could have been impossible for them to be occupied on the surface of the amphitheatre at the same time. We can see now how this was made possible. In analysing the structures of the monument I was attracted by the singular arrangement of some travertine pillars embedded in the radial walls. Also Choisy had noticed these pillars, but he could not draw a conclusion about their actual function. 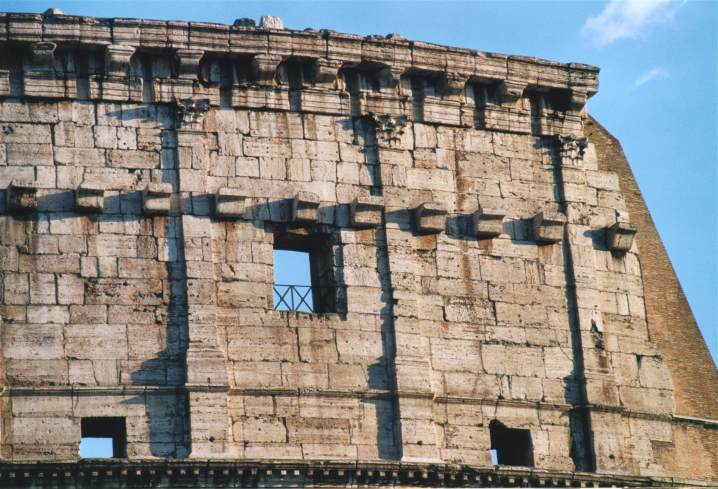 The filling between these four pillars, that reach the second floor and end just beneath the cavea, has been made with square tufa blocks on the ground floor and with cement and a face of semilateres (big halfbricks) on the second floor. 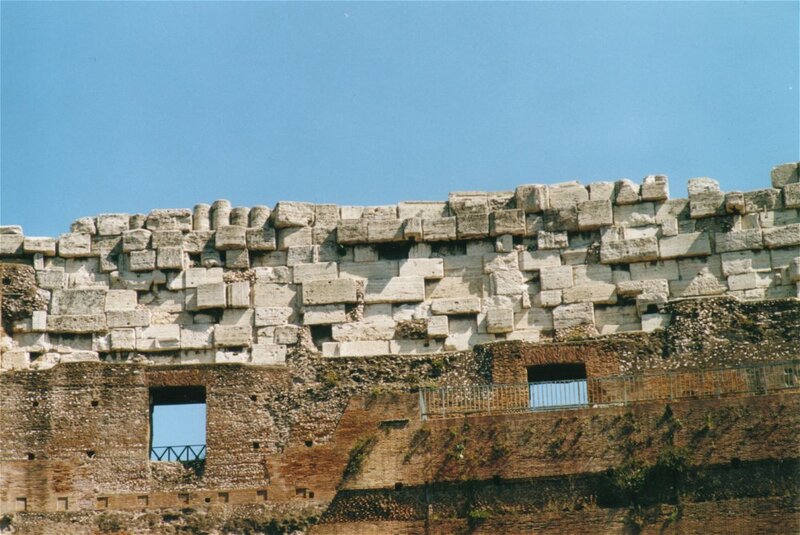 In these radial walls the travertine pillars are connected at the top by large arches made by bipedali bricks, about two feet (60 cm) tall, arranged to allow the building of many "volte rampanti", vaults supported by walls, that all together constitute the great funnel, or cavea, destined to support the marble seats for the public. Now, almost all these large arches show a striking external arrangement: the way they end up near the edge of the travertine pillars would lead one to think that there is no supporting surface. 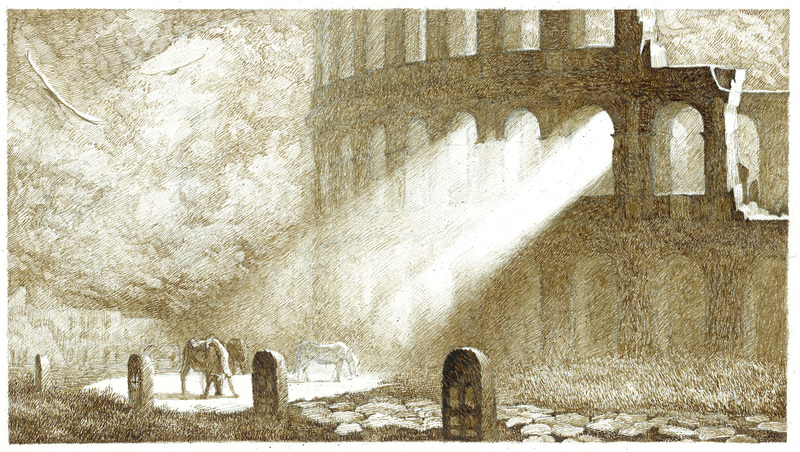 If this had been true, then the existence of the arches and the corresponding travertine pillars would not be justified. 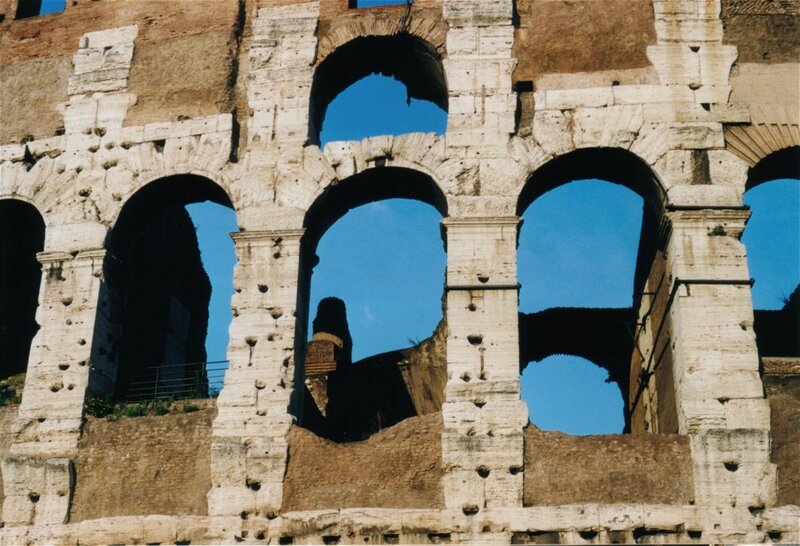 Instead, an accurate investigation, carried out where the arch has disappeared, or where a part of the facing is missing, has revealed the existence of a supporting impost emerging from the sides of one of the travertine blocks placed in the upper part of each pillar. This internal impost, hidden by the external facing, ensured support and stability to the arch. A second finding followed the first one: the tufa structures of opus quadratum and the upper ones of bricks, that fill up the spaces between the travertine pillars (and that, together with the pillars, constitute the radial walls of the amphitheatre) can be considered as completely independent from the pillars and from the upper big arches, therefore built after them, at a later time. This possibility is made more evident by the great facility of working the tufa stone, and by the renowned ability of the Romans in executing the opus quadratum. The image on the right (taken from Cozzo’s book) shows how the travertine blocks of the external facade, with sculpted half columns, have been sometimes mounted overlooking the best practice (i.e. 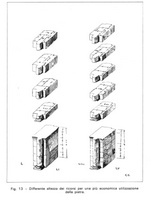 placing blocks of the same size one on top of the other), perhaps with the intent to speed up the completion or to optimise the use of the stones. On the ground floor, for instance, where the intermediate travertine pillars in the radial structures present also some projections and hollows so as to ensure the grip with the tufa opus quadratum structure, nothing excludes that this opus quadratum was built independently from the rising of the pillars. Actually, this independence is demonstrated by a certain length of a radial wall, in which the base of the opus quadratum is completely independent from the base of the travertine pillars. Though this independence does not result at first sight equally evident in all the radial walls of the ground floor, we can be completely assured of its existence by a great lot of little details that cannot escape a careful investigation. On the other hand, it is sufficient to demonstrate it in some points, in order to accept it for the rest of the building. On the second floor of the amphitheatre this independence between the travertine pillars and the tufa or brick walls is demonstrated beyond any discussion by photographic evidence. 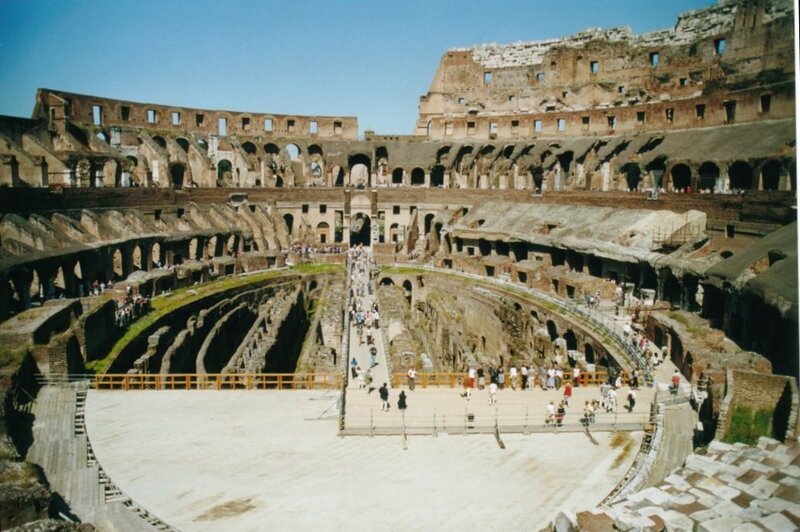 It is therefore clear the genial concept behind the building of the amphitheatre. 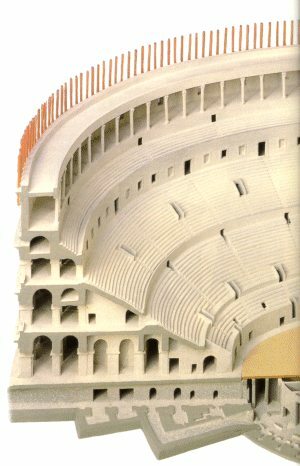 The travertine pillars, in the area behind the cavea, were in a first moment completely isolated, then they were connected into a single organism by the arches, and in a first phase both pillars and arches supported, like an independent skeleton, the vaults supporting the cavea, before the gaps between the pillars were filled up with masonry. The dimensions of these pillars and their construction were perfectly compliant with the load assigned to them and to their function, a thing that reveals a real ingenuity of the ancient Romans in building and organising.This building procedure, both simple and evident, allowed to build very quickly the big cavea and to shelter the walkways on the second floor; at the same time it allowed for the coexistence of two vast building yards on the same site; a first one, below, completely covered, sheltered from the rain, and a second upper one, above the cavea, working on the upper part of the amphitheatre. 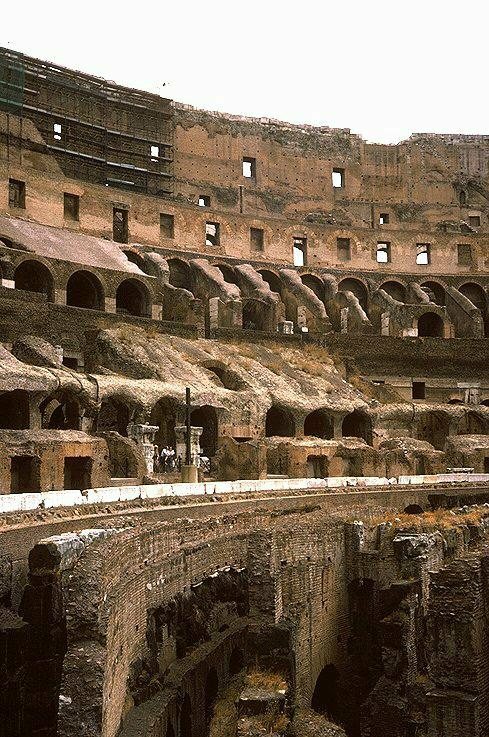 Below, in the construction sites under coverage, were completed all the walls between the travertine pillars, the rampant bridging of the stairs, the vaults of the ground floor walkways, the plastering and the stuccoes. 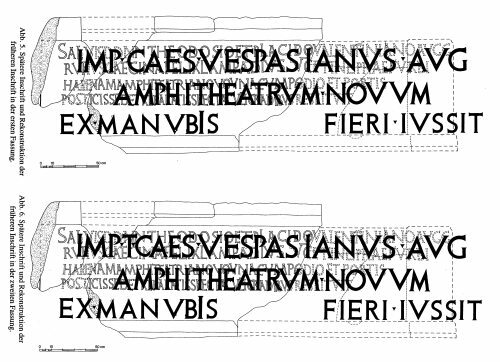 Above, work could be carried out on the walls of the remaining two floors of the amphitheatre, the podium, the seats, and the wooden upper portico.It is singular that this system recalls a scheme of caging frequent in the Roman provinces of Africa, e.g. in Timgad, with networks of stone pillars and beams. The system survived in the Middle Ages in an interesting form in the so-called Torri Pisane, of the XII century, where the stone pillars, the gothic arches and the beams in the middle constitute a frame for the brick filling of the walls. There the same concept is inspired to a similar purpose: separating the skeleton from the filling so as to quickly accomplish the job by multiplying the space of the building site, creating a big surface of superimposed floors, dividing and attacking the work from more points.We find today the very same concept in the recent buildings made with concrete and steel that represent the latest novelty of rapidity in modern construction. 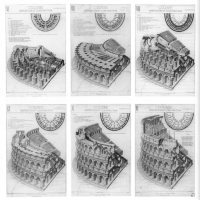 So, the rise of the highest skyscrapers in North America was achieved so quickly to that we are in amazement just like when we think of the building of the Colosseum.